Learn how to make omelet rice (Japanese omurice)! This is an easy (cheat) version! I often feel like cooking something very simple without taking much effort, yet want to pretend that I spent some good time on it. Do you ever feel the same way? Then this omelet rice might come in handy. In fact, I cooked it 4 times in the last week already. Michael was very intrigued how I cover the rice with the eggs so well. Although dicing vegetables can be a little annoying and the most time consuming part of the process, it is quite simple to make. Would you like to pretend too? Dice carrot, onion, red capsicums, ham and crab stick. 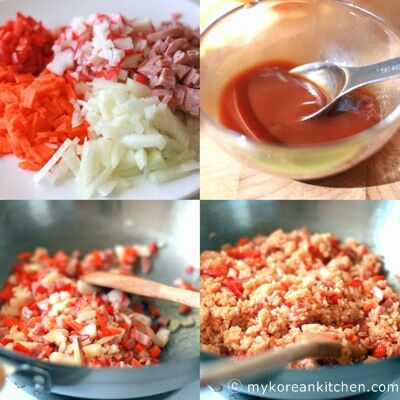 Mix the tomato sauce (3 tbsp) and worcestershire sauce in a bowl. Pre heat the wok on high heat for 10 seconds and add some oil. Add all diced ingredients and saute for 1 minute. Reduce the heat to half. Add the steamed rice and the mixed sauce. Mix them well for 30 seconds. Beat two eggs in a bowl and add a pinch of salt. Heat a frying pan and add some oil. Pour the egg in the frying pan. Quickly spread the egg and make a thin, large, and round omelet. Repeat step 1 to 4 for the rest of the eggs. When the omelets are made, place them in deep bowls. Put the stir fried rice on top of each omelet. Put the plate on top of the bowls. Turn them up side down and remove the bowl. Make a cross cut on top of the omelets and add some tomato sauce on top. 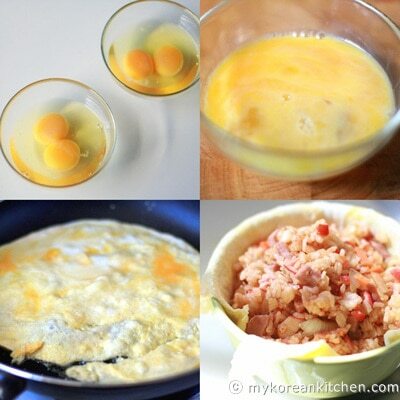 How to Make Omelet Rice (Japanese Omurice). This is an easy (cheat) version! i love rooftop prince ever… i wanted to see them.. This omurice is a cheater version. 🙂 I did this to make the “wrapping” easier. 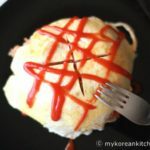 after watching the Korean dramas Playful Kiss & Rooftop Prince I madly wanted to taste the Omurice… thanks 4 the recipe, I’ll enjoy cooking & eating Omurice ! I hope you enjoy your omurice! OMG! I made this too after watching Roof top Prince! Its Yummy! Ouh my no doubt after watching the Roof Top Prince, i kinda like the simple meal prepared by Park Ha. And here I am looking into the recipe, indeed its simple and straightforward. Thanks for sharing, at least now i know what i do if i have left over rice which normally gosh into the rubbish bin. OMGOSH! 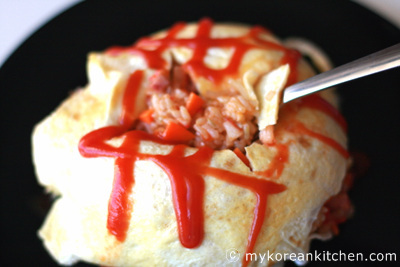 I’m soo craving for omurice after watching Rooftop Prince. Hi Hadijah Manan! I am looking for this recipe after I have watched Roof Top Prince! I really love Rooftop Prince and I was searching for this recipe for a long time 😀 Now here it is!!! Thats why Im here. Looking for its recipe…. For Sandra, do not soaked the rice, use the steamed rice instead(the normal way on how to cooked the rice). Does anyone have thoughts on how long you need to soak your rice before cooking? My grandmother did it overnight and it tasted great but sometimes you just forget to do it the night before. I used to eat this when I was in Korea in 1966. It was great. I used to think the Koreans were calling it Home Rice. Great recipe. But I find it delicious with Green Paprika and extra garlic as well. Too bad, most restaurants in Korea pour massive amounts of flavour enhancers in virtually all dishes including omurice. This is not Korean food. It seems Korean-American – yes that pejorative is needed to justify this utterly horrible recipe. On the contrary, it’s originally Japanese. WOW, amazing, and thanks for your share. Thank you! I am terrible at making omelets, so your bowl trick made my otherwise pretty fail omurice look pretty damned good. Oh my gosh! I pack my lunch for my older sister (who is a big lazy bum that can’t make her own lunch ^^) and myself. 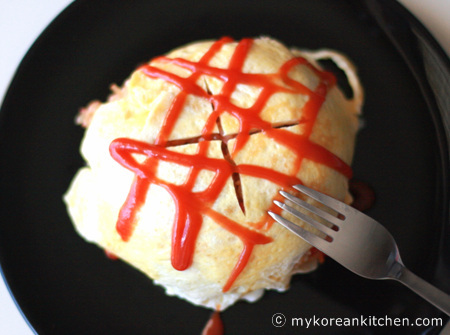 I grew up eating omurice when I lived in Korea. I haven;t had once since I was eight! I going to make them mini-omurice tomorrow as a special becasue tomorrow is the end of my sister’s SAT testing!! Wow~~!! Thanks for sharing. By far, this has been the best recipe! ^___^ I am gonna try this out! We thoroughly enjoyed the Omurice. I’ll be making this again. Thank You! Ingenious! Most of the time I am lazy and will only make thin omelets, then roll and cut them in strips to pile on top of fried rice, or worse, I just include scrambled egg in the fried rice. Omuraisu in it’s real form has eluded me! I will try your idea next time–great looking result for such a simple technique. Mmmm. . . I made this recipe and it was great! Thanks, Sue! Hi Sue, I have tried it for dinner tonight. It was a success. It’s so easy to make, and yet it looked like a cuisine ^^. Thanks so much. I will be trying more of your Korean dishes. I didn’t know this was an actual dish, I thought it was just something my Kinapa invented 🙂 I love to make this with some SPAM or chicken and some ranch dressing as a dip, weird, huh? And that’s a great idea to cut the cross on top and eat it that way, I’ll have to try this next time! Thanks everyone for your kind words. I didn’t expect these sensational reactions to this omelet. 🙂 I really hope you and your families enjoy having your omelet as much as I did. Good luck to you all! I’ve just drooled all over my keyboard. I just found this site and am really excited. Omurice is one of my favorite dishes from my childhood. My mom would never take the care in crafting the shape of the omelette like you’ve done so well, but it looks just like I remember tasting it. so so so good. Hi , Yes, I will definitely pretend this weekend. Our almost 3yr old saw a photo of your masterpiece and said “YUM!”. He took the words right out of my mouth. I’ll be making it on the weekend. ooh, omurice, haven’t had that in ages! I also like omusoba, where you put yakisoba inside instead of rice. This is just the most delicious looking thing I’ve seen in ages. I can’t wait to make it! Yum! Thanks for sharing a nice tip on how to put the rice inside the omelette! I will have to try this one day, it seem so easy! That’s a neat idea to cover the rice with the egg. 🙂 I don’t like to spend time dicing vegetables too, so I usually buy them frozen. If I buy them fresh, sometimes I cannot finish what I bought anyway. That definitely looks awesome. And simple too. I shall be trying it out soon. Thanks for the recipe!